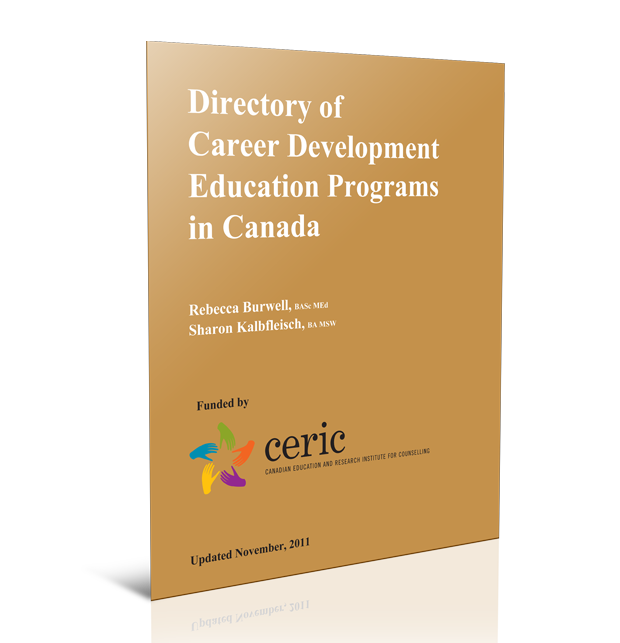 This Directory, funded by CERIC and co-researched by Rebecca Burwell and Sharon Kalbfleisch, was first completed in 2006, but has been updated (2011) as part of the three-phase research project titled “A Model for the Education of Career Practitioners in Canada”. counsellors/career development practitioners a tool by which to review the various Canadian programs in existence today. We also hope that this Directory will be helpful to career counsellor educators in beginning to identify connections between and among programs. To begin to compile a list of career counselling/career development education programs, it was necessary first to define what criteria would be used to determine inclusion in the Directory. Our criteria for inclusion in the Directory became: (a) any program, at any level, whose main focus is career counselling/career development; or (b) any program that offers students a minimum of two career development courses within a department where at least one faculty member is conducting research in the area of career development.